No amount of care and patience would be too great to spend assembling and painting the 160 parts of this beautiful Sunnderland Flying Boat model. Working bomb gear, beaching trolley, operating gun turrets and crew members, are all there, engineered with Airfix accurcy and attention to detail. Used in the War against U-Boats, then in the Berlin air lift and the Korean War, the Sunderland has a proud history. 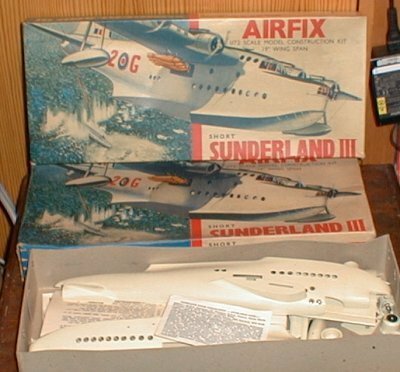 The Sunderland III, subject of this Airfix Constant Scale kit, was powered by 4 Pegasus XVIII 1,000 h.p. engines, giving her a maximum speed of 210 miles per hour, with a cruising duration of 12 hours. Her armament load of bombs, mines, or depth charges, was 4,960 lbs. and she could carry up to 14 machine guns.